Amazon EC2 Spot Instances let you take advantage of unused EC2 capacity in the AWS cloud. Spot Instances are available at up to a 90% discount compared to On-Demand prices. You can use Spot Instances for various stateless, fault-tolerant, or flexible applications such as big data, containerized workloads, CI/CD, web servers, high-performance computing (HPC), and other test & development workloads. Because Spot Instances are tightly integrated with AWS services such as Auto Scaling, EMR, ECS, CloudFormation, Data Pipeline and AWS Batch, you can choose how to launch and maintain your applications running on Spot Instances. Moreover, you can easily combine Spot Instances with On-Demand and RIs to further optimize workload cost with performance. Due to the operating scale of AWS, Spot Instances can offer the scale and cost savings to run hyper-scale workloads. You also have the option to hibernate, stop or terminate your Spot Instances when EC2 reclaims the capacity back with two-minutes of notice. Only on AWS, you have easy access to unused compute capacity at such massive scale - all at up to a 90% discount. Why Use Amazon EC2 Spot Instances? You can purchase Spot Instances at prices up to 90% lower than On-Demand instances. 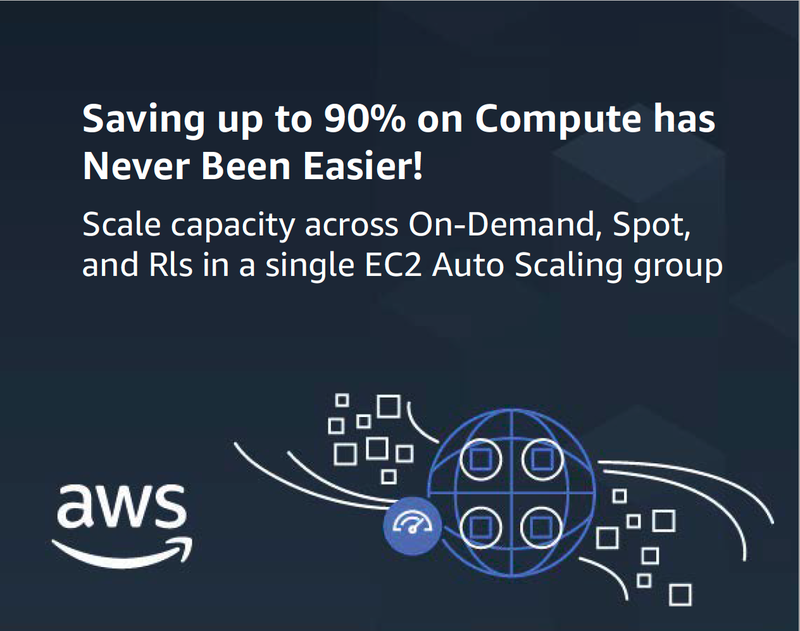 Moreover, you can provision capacity across Spot, On-Demand, and RIs using EC2 Auto Scaling to optimize workload cost with performance. Spot offers you the advantages of the massive operating scale of AWS. You can run hyperscale workloads at a significant cost savings or you can accelerate your workloads by running parallel tasks. It’s easy to launch, scale and manage Spot Instances through AWS services, like EC2 Auto Scaling and ECS, or integrated third parties, like Terraform and Jenkins. Combine Spot Instances with RIs and On-Demand Instances using EC2 Auto Scaling to optimize workload cost with performance. Click to see other the Best Practices to use Spot effectively. More and more businesses are using Amazon EC2 Spot Instances to run and scale their infrastructure cost-effectively. Here are some examples of how customers have achieved business agility, cost savings, and scale with EC2 Spot Instances. For more details, visit Amazon EC2 Spot Customers page.